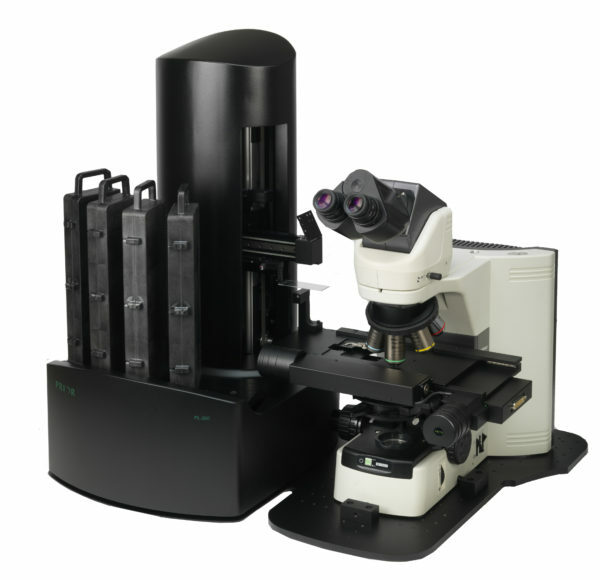 The PL-100/PL-200 Slide Loaders are advanced systems for automatic slide handling in a variety of microscope applications. The PL-200 model is designed for 1×3 slides and accommodates up to 200 slides that are housed in four removable slide racks, each of which holds up to fifty slides. The PL-100 model is designed for 2×3 slides and is capable of handling up to 100 slideswhich are housed in two racks of fifty. Sensors on the loader monitor the presence of the slide racks so the system can intelligently respond when racks are changed in the middle of a run for example. Installation of a rack on the loader initiates a unique slide detection system which automatically identifies the location of the slides. Prior has optimized both to provide the highest productivity with a complete system capable of performing load/unload cycles in as little as 24s. The units can be used with existing microscopes simply by adding the appropriate Prior scanning stage. Prepared specimen slides are precious, often unique, and need to be handled with care. In addition to the slide retaining design of the slide racks, a range of further safety features have been included in the units to minimize the risk of damage to slides. The slide gripper includes a sensor to detect the presence of a slide. If the state of this sensor changes due to an absent slide for example, the system will stop and report an error message. A similar approach is taken on the scanning stage where a sensor identifies if a slide is present on the stage. Slide scanning will not take place for example, if a slide is not successfully placed onto the stage. A third sensor is used to monitor the position of the slide relative to the stage. If the user inadvertently moves the scanning stage in the Z axis, collisions are avoided by this sensor.